Rubik's Cube is a 3-D combination puzzle invented in 1974 by Hungarian sculptor and professor of architecture Ernő Rubik. Originally called the Magic Cube, the puzzle was licensed by Rubik to be sold by Ideal Toy Corp. in 1980 via businessman Tibor Laczi and Seven Towns founder Tom Kremer, and won the German Game of the Year special award for Best Puzzle that year. As of January 2009, 350 million cubes had been sold worldwide making it the world's top-selling puzzle game. It is widely considered to be the world's best-selling toy. On a classic Rubik's Cube, each of the six faces is covered by nine stickers, each of one of six solid colours: white, red, blue, orange, green, and yellow. In currently sold models, white is opposite yellow, blue is opposite green, and orange is opposite red, and the red, white and blue are arranged in that order in a clockwise arrangement. On early cubes, the position of the colours varied from cube to cube. An internal pivot mechanism enables each face to turn independently, thus mixing up the colours. For the puzzle to be solved, each face must be returned to have only one colour. Similar puzzles have now been produced with various numbers of sides, dimensions, and stickers, not all of them by Rubik. Although the Rubik's Cube reached its height of mainstream popularity in the 1980s, it is still widely known and used. Many speedcubers continue to practice it and other twisty puzzles and compete for the fastest times in various categories. Since 2003, The World Cube Association, the Rubik's Cube's international governing body, has organised competitions worldwide and kept the official world records. Licensed under Creative Commons Attribution-Share Alike 3.0 (This image was created by me, Booyabazooka). Rubik's Cube is a 3-D combination puzzle invented in 1974 by Hungarian sculptor and professor of architecture Ernő Rubik. Originally called the Magic Cube, the puzzle was licensed by Rubik to be sold by Ideal Toy Corp. in 1980 via businessman Tibor Laczi and Seven Towns founder Tom Kremer, and won the German Game of the Year special award for Best Puzzle that year. As of January 2009, 350 million cubes had been sold worldwide making it the world's top-selling puzzle game. It is widely considered to be the world's best-selling toy. On a classic Rubik's Cube, each of the six faces is covered by nine stickers, each of one of six solid colours: white, red, blue, orange, green, and yellow. In currently sold models, white is opposite yellow, blue is opposite green, and orange is opposite red, and the red, white and blue are arranged in that order in a clockwise arrangement. On early cubes, the position of the colours varied from cube to cube. An internal pivot mechanism enables each face to turn independently, thus mixing up the colours. For the puzzle to be solved, each face must be returned to have only one colour. Similar puzzles have now been produced with various numbers of sides, dimensions, and stickers, not all of them by Rubik. Although the Rubik's Cube reached its height of mainstream popularity in the 1980s, it is still widely known and used. Many speedcubers continue to practice it and other twisty puzzles and compete for the fastest times in various categories. Since 2003, The World Cube Association, the Rubik's Cube's international governing body, has organised competitions worldwide and kept the official world records. In March 1970, Larry D. Nichols invented a 2×2×2 "Puzzle with Pieces Rotatable in Groups" and filed a Canadian patent application for it. Nichols's cube was held together with magnets. Nichols was granted U.S. Patent 3,655,201 on April 11, 1972, two years before Rubik invented his Cube. On April 9, 1970, Frank Fox applied to patent his "Spherical 3×3×3". He received his UK patent (1344259) on January 16, 1974. In the mid-1970s, Ernő Rubik worked at the Department of Interior Design at the Academy of Applied Arts and Crafts in Budapest. Although it is widely reported that the Cube was built as a teaching tool to help his students understand 3D objects, his actual purpose was solving the structural problem of moving the parts independently without the entire mechanism falling apart. He did not realise that he had created a puzzle until the first time he scrambled his new Cube and then tried to restore it. Rubik obtained Hungarian patent HU170062 for his "Magic Cube" in 1975. Rubik's Cube was first called the Magic Cube (Bűvös kocka) in Hungary. Ideal wanted at least a recognisable name to trademark; of course, that arrangement put Rubik in the spotlight because the Magic Cube was renamed after its inventor in 1980. The first test batches of the Magic Cube were produced in late 1977 and released in Budapest toy shops. Magic Cube was held together with interlocking plastic pieces that prevented the puzzle being easily pulled apart, unlike the magnets in Nichols's design. With Ernő Rubik's permission, businessman Tibor Laczi took a Cube to Germany's Nuremberg Toy Fair in February 1979 in an attempt to popularise it. It was noticed by Seven Towns founder Tom Kremer and they signed a deal with Ideal Toys in September 1979 to release the Magic Cube worldwide. The puzzle made its international debut at the toy fairs of London, Paris, Nuremberg and New York in January and February 1980. After its international debut, the progress of the Cube towards the toy shop shelves of the West was briefly halted so that it could be manufactured to Western safety and packaging specifications. A lighter Cube was produced, and Ideal decided to rename it. "The Gordian Knot" and "Inca Gold" were considered, but the company finally decided on "Rubik's Cube", and the first batch was exported from Hungary in May 1980. After the first batches of Rubik's Cubes were released in May 1980, initial sales were modest, but Ideal began a television advertising campaign in the middle of the year which it supplemented with newspaper adverts. At the end of 1980 Rubik's Cube won a German Game of the Year special award, and won similar awards for best toy in the UK, France, and the USA. By 1981 Rubik's Cube had become a craze, and it is estimated that in the period from 1980 to 1983 around 200 million Rubik's Cubes were sold worldwide. In March 1981 the first speedcubing championship organised by the Guinness Book of World Records was held in Munich, and a Rubik's Cube was depicted on the front cover of Scientific American that same month. In June 1981 The Washington Post reported that the Rubik's Cube is "a puzzle that's moving like fast food right now ... this year's Hoola Hoop or Bongo Board", and by September 1981 New Scientist noted that the cube had "captivated the attention of children of ages from 7 to 70 all over the world this summer." As most people could only solve one or two sides, numerous books were published including David Singmaster's Notes on Rubik's "Magic Cube" (1980) and Patrick Bossert's You Can Do the Cube (1981). At one stage in 1981 three of the top ten best selling books in the USA were books on solving the Rubik's Cube, and the best-selling book of 1981 was James G. Nourse's The Simple Solution to Rubik's Cube which sold over 6 million copies. In 1981 the Museum of Modern Art in New York exhibited a Rubik's Cube, and at the 1982 World's Fair in Knoxville, Tennessee a six-foot Cube was put on display. ABC Television even developed a cartoon show called Rubik, the Amazing Cube. In June 1982 the First Rubik's Cube World Championship took place in Budapest, and would become the only competition recognized as official until the championship was revived in 2003. In October 1982 The New York Times reported that sales had fallen and that "the craze has died", and by 1983 it was clear that sales had plummeted. However, in some Communist countries, such as China and Russia, the craze had started later and demand was still high because of a shortage of Cubes. Rubik's Cubes continued to be marketed and sold throughout the 1980s and 90s, but it wasn't until the early 2000s that interest in the Cube began increasing again. In the USA sales doubled between 2001 and 2003, and The Boston Globe remarked that it was "becoming cool to own a Cube again". The 2003 World Rubik's Games Championship was the first speedcubing tournament since 1982. It was held in Toronto and was attended by 83 participants. The tournament led to the formation of the World Cube Association in 2004. Annual sales of Rubik branded cubes were said to have reached 15 million worldwide in 2008. Part of the new appeal was ascribed to the advent of Internet video sites, such as YouTube, which allowed fans to share their solving strategies. Following the expiration of Rubik's patent in 2000, other brands of cubes appeared, especially from Chinese companies. Many of these Chinese branded cubes have been engineered for speed and are favoured by speedcubers. Taking advantage of an initial shortage of Cubes, many imitations and variations appeared, many of which may have violated one or more patents. Today, the patents have expired and many Chinese companies produce copies of, and in some cases improvements upon, the Rubik and V-Cube designs. Nichols assigned his patent to his employer Moleculon Research Corp., which sued Ideal in 1982. In 1984, Ideal lost the patent infringement suit and appealed. 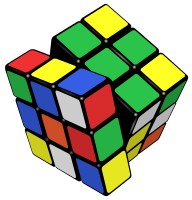 In 1986, the appeals court affirmed the judgment that Rubik's 2×2×2 Pocket Cube infringed Nichols's patent, but overturned the judgment on Rubik's 3×3×3 Cube. Even while Rubik's patent application was being processed, Terutoshi Ishigi, a self-taught engineer and ironworks owner near Tokyo, filed for a Japanese patent for a nearly identical mechanism, which was granted in 1976 (Japanese patent publication JP55-008192). Until 1999, when an amended Japanese patent law was enforced, Japan's patent office granted Japanese patents for non-disclosed technology within Japan without requiring worldwide novelty. Hence, Ishigi's patent is generally accepted as an independent reinvention at that time. Rubik applied for more patents in 1980, including another Hungarian patent on October 28. In the United States, Rubik was granted U.S. Patent 4,378,116 on March 29, 1983, for the Cube. This patent expired in 2000. Greek inventor Panagiotis Verdes patented a method of creating cubes beyond the 5×5×5, up to 11×11×11, in 2003. As of 2017, the 5×5×5, 6×6×6, 7×7×7, 8×8×8 and 9×9×9 models are in production in his "V-Cube" line. V-Cube also produces a 2×2×2, 3×3×3 and a 4×4×4. Rubik's Brand Ltd. also holds the registered trademarks for the word Rubik and Rubik's and for the 2D and 3D visualisations of the puzzle. The trademarks have been upheld by a ruling of the General Court of the European Union on 25 November 2014 in a successful defence against a German toy manufacturer seeking to invalidate them. However, European toy manufacturers are allowed to create differently shaped puzzles that have a similar rotating or twisting functionality of component parts such as for example Skewb, Pyraminx or Impossiball. On 10 November 2016, Rubik's Cube lost a ten-year battle over a key trademark issue. The European Union's highest court, the Court of Justice ruled that the puzzle's shape was not sufficient to grant it trademark protection. A standard Rubik's Cube measures 5.7 centimetres (2 1⁄4 in) on each side. The puzzle consists of twenty-six unique miniature cubes, also called "cubies" or "cubelets". Each of these includes a concealed inward extension that interlocks with the other cubes, while permitting them to move to different locations. However, the centre cube of each of the six faces is merely a single square façade; all six are affixed to the core mechanism. These provide structure for the other pieces to fit into and rotate around. So there are twenty-one pieces: a single core piece consisting of three intersecting axes holding the six centre squares in place but letting them rotate, and twenty smaller plastic pieces which fit into it to form the assembled puzzle. Each of the six centre pieces pivots on a screw (fastener) held by the centre piece, a "3D cross". A spring between each screw head and its corresponding piece tensions the piece inward, so that collectively, the whole assembly remains compact, but can still be easily manipulated. The screw can be tightened or loosened to change the "feel" of the Cube. Newer official Rubik's brand cubes have rivets instead of screws and cannot be adjusted. The Cube can be taken apart without much difficulty, typically by rotating the top layer by 45° and then prying one of its edge cubes away from the other two layers. Consequently, it is a simple process to "solve" a Cube by taking it apart and reassembling it in a solved state. There are six central pieces which show one coloured face, twelve edge pieces which show two coloured faces, and eight corner pieces which show three coloured faces. Each piece shows a unique colour combination, but not all combinations are present (for example, if red and orange are on opposite sides of the solved Cube, there is no edge piece with both red and orange sides). The location of these cubes relative to one another can be altered by twisting an outer third of the Cube 90°, 180° or 270°, but the location of the coloured sides relative to one another in the completed state of the puzzle cannot be altered: it is fixed by the relative positions of the centre squares. However, Cubes with alternative colour arrangements also exist; for example, with the yellow face opposite the green, the blue face opposite the white, and red and orange remaining opposite each other. Douglas Hofstadter, in the July 1982 issue of Scientific American, pointed out that Cubes could be coloured in such a way as to emphasise the corners or edges, rather than the faces as the standard colouring does; but neither of these alternative colourings has ever become popular. The original (3×3×3) Rubik's Cube has eight corners and twelve edges. There are 8! (40,320) ways to arrange the corner cubes. Each corner has three possible orientations, although only seven (of eight) can be oriented independently; the orientation of the eighth (final) corner depends on the preceding seven, giving 37 (2,187) possibilities. There are 12!/2 (239,500,800) ways to arrange the edges, restricted from 12! because edges must be in an even permutation exactly when the corners are. (When arrangements of centres are also permitted, as described below, the rule is that the combined arrangement of corners, edges, and centres must be an even permutation.) Eleven edges can be flipped independently, with the flip of the twelfth depending on the preceding ones, giving 211 (2,048) possibilities. which is approximately 43 quintillion. The puzzle was originally advertised as having "over 3,000,000,000 (three billion) combinations but only one solution". To put this into perspective, if one had as many standard sized Rubik's Cubes as there are permutations, one could cover the Earth's surface 275 times. which is approximately 519 quintillion possible arrangements of the pieces that make up the Cube, but only one in twelve of these are actually solvable. This is because there is no sequence of moves that will swap a single pair of pieces or rotate a single corner or edge cube. Thus there are twelve possible sets of reachable configurations, sometimes called "universes" or "orbits", into which the Cube can be placed by dismantling and reassembling it. The original Rubik's Cube had no orientation markings on the centre faces (although some carried the words "Rubik's Cube" on the centre square of the white face), and therefore solving it does not require any attention to orienting those faces correctly. However, with marker pens, one could, for example, mark the central squares of an unscrambled Cube with four coloured marks on each edge, each corresponding to the colour of the adjacent face; a cube marked in this way is referred to as a "supercube". Some Cubes have also been produced commercially with markings on all of the squares, such as the Lo Shu magic square or playing card suits. Thus one can nominally solve a Cube yet have the markings on the centres rotated; it then becomes an additional test to solve the centres as well. Marking the Rubik's Cube's centres increases its difficulty because this expands the set of distinguishable possible configurations. There are 46/2 (2,048) ways to orient the centres, since an even permutation of the corners implies an even number of quarter turns of centres as well. In particular, when the Cube is unscrambled apart from the orientations of the central squares, there will always be an even number of centre squares requiring a quarter turn. Thus orientations of centres increases the total number of possible Cube permutations from 43,252,003,274,489,856,000 (4.3×1019) to 88,580,102,706,155,225,088,000 (8.9×1022). When turning a cube over is considered to be a change in permutation then we must also count arrangements of the centre faces. Nominally there are 6! ways to arrange the six centre faces of the cube, but only 24 of these are achievable without disassembly of the cube. When the orientations of centres are also counted, as above, this increases the total number of possible Cube permutations from 88,580,102,706,155,225,088,000 (8.9×1022) to 2,125,922,464,947,725,402,112,000 (2.1×1024). In Rubik's cubers' parlance, a memorised sequence of moves that has a desired effect on the cube is called an algorithm. This terminology is derived from the mathematical use of algorithm, meaning a list of well-defined instructions for performing a task from a given initial state, through well-defined successive states, to a desired end-state. Each method of solving the Rubik's Cube employs its own set of algorithms, together with descriptions of what effect the algorithm has, and when it can be used to bring the cube closer to being solved. Many algorithms are designed to transform only a small part of the cube without interfering with other parts that have already been solved, so that they can be applied repeatedly to different parts of the cube until the whole is solved. For example, there are well-known algorithms for cycling three corners without changing the rest of the puzzle, or flipping the orientation of a pair of edges while leaving the others intact. Some algorithms do have a certain desired effect on the cube (for example, swapping two corners) but may also have the side-effect of changing other parts of the cube (such as permuting some edges). Such algorithms are often simpler than the ones without side-effects, and are employed early on in the solution when most of the puzzle has not yet been solved and the side-effects are not important. Most are long and difficult to memorise. Towards the end of the solution, the more specific (and usually more complicated) algorithms are used instead. Rubik's Cube lends itself to the application of mathematical group theory, which has been helpful for deducing certain algorithms - in particular, those which have a commutator structure, namely XYX−1Y−1 (where X and Y are specific moves or move-sequences and X−1 and Y−1 are their respective inverses), or a conjugate structure, namely XYX−1, often referred to by speedcubers colloquially as a "setup move". In addition, the fact that there are well-defined subgroups within the Rubik's Cube group enables the puzzle to be learned and mastered by moving up through various self-contained "levels of difficulty". For example, one such "level" could involve solving cubes which have been scrambled using only 180-degree turns. These subgroups are the principle underlying the computer cubing methods by Thistlethwaite and Kociemba, which solve the cube by further reducing it to another subgroup. Many 3×3×3 Rubik's Cube enthusiasts use a notation developed by David Singmaster to denote a sequence of moves, referred to as "Singmaster notation". Its relative nature allows algorithms to be written in such a way that they can be applied regardless of which side is designated the top or how the colours are organised on a particular cube. When a prime symbol ( ′ ) follows a letter, it denotes a face turn counter-clockwise, while a letter without a prime symbol denotes a clockwise turn. A letter followed by a 2 (occasionally a superscript 2) denotes two turns, or a 180-degree turn. R is right side clockwise, but R' is right side counter-clockwise. The letters x, y, and z are used to indicate that the entire Cube should be turned about one of its axes, corresponding to R, U, and F turns respectively. When x, y or z are primed, it is an indication that the cube must be rotated in the opposite direction. When they are squared, the cube must be rotated 180 degrees. The most common deviation from Singmaster notation, and in fact the current official standard, is to use "w", for "wide", instead of lowercase letters to represent moves of two layers; thus, a move of Rw is equivalent to one of r.
For methods using middle-layer turns (particularly corners-first methods) there is a generally accepted "MES" extension to the notation where letters M, E, and S denote middle layer turns. It was used e.g. in Marc Waterman's Algorithm. The 4×4×4 and larger cubes use an extended notation to refer to the additional middle layers. Generally speaking, uppercase letters (F B U D L R) refer to the outermost portions of the cube (called faces). Lowercase letters (f b u d l r) refer to the inner portions of the cube (called slices). An asterisk (L*), a number in front of it (2L), or two layers in parentheses (Ll), means to turn the two layers at the same time (both the inner and the outer left faces) For example: (Rr)' l2 f' means to turn the two rightmost layers anticlockwise, then the left inner layer twice, and then the inner front layer anticlockwise. By extension, for cubes of 6x6 and larger, moves of three layers are notated by the number 3, for example 3L. An alternative notation, Wolstenholme notation, is designed to make memorising sequences of moves easier for novices. This notation uses the same letters for faces except it replaces U with T (top), so that all are consonants. The key difference is the use of the vowels O, A and I for clockwise, anticlockwise and 180-degree turns, which results in word-like sequences such as LOTA RATO LATA ROTI (equivalent to LU′R′UL′U′RU2 in Singmaster notation). Addition of a C implies rotation of the entire cube, so ROC is the clockwise rotation of the cube around its right face. Middle layer moves are denoted by adding an M to corresponding face move, so RIM means a 180-degree turn of the middle layer adjacent to the R face. Yet another notation appeared in the 1981 book The Simple Solution to Rubik's Cube. Singmaster notation was not widely known at the time of publication. The faces were named Top (T), Bottom (B), Left (L), Right (R), Front (F) and Posterior (P), with + for clockwise, - for anticlockwise and 2 for 180-degree turns. Although there are a significant number of possible permutations for the Rubik's Cube, a number of solutions have been developed which allow solving the cube in well under 100 moves. Many general solutions for the Rubik's Cube have been discovered independently. David Singmaster first published his solution in the book Notes on Rubik's "Magic Cube" in 1981. This solution involves solving the Cube layer by layer, in which one layer (designated the top) is solved first, followed by the middle layer, and then the final and bottom layer. After sufficient practice, solving the Cube layer by layer can be done in under one minute. Other general solutions include "corners first" methods or combinations of several other methods. In 1982, David Singmaster and Alexander Frey hypothesised that the number of moves needed to solve the Rubik's Cube, given an ideal algorithm, might be in "the low twenties". In 2007, Daniel Kunkle and Gene Cooperman used computer search methods to demonstrate that any 3×3×3 Rubik's Cube configuration can be solved in 26 moves or fewer. In 2008, Tomas Rokicki lowered that number to 22 moves, and in July 2010, a team of researchers including Rokicki, working with Google, proved the so-called "God's number" to be 20. This is optimal, since there exist some starting positions which require a minimum of 20 moves to solve. More generally, it has been shown that an n×n×n Rubik's Cube can be solved optimally in Θ(n2 / log(n)) moves. In 1981, thirteen-year-old Patrick Bossert developed a solution for solving the cube, along with a graphical notation, designed to be easily understood by novices. It was subsequently published as You Can Do The Cube and became a best-seller. A solution commonly used by speed cubers was developed by Jessica Fridrich. It is similar to the layer-by-layer method but employs the use of a large number of algorithms, especially for orienting and permuting the last layer. The cross is done first, followed by first layer corners and second layer edges simultaneously, with each corner paired up with a second-layer edge piece, thus completing the first two layers (F2L). This is then followed by orienting the last layer, then permuting the last layer (OLL and PLL respectively). Fridrich's solution requires learning roughly 120 algorithms but allows the Cube to be solved in only 55 moves on average. Philip Marshall's The Ultimate Solution to Rubik's Cube takes a different approach, averaging only 65 twists yet requiring the memorisation of only two algorithms. The cross is solved first, followed by the remaining edges, then five corners, and finally the last three corners. A now well-known method was developed by Lars Petrus. In this method, a 2×2×2 section is solved first, followed by a 2×2×3, and then the incorrect edges are solved using a three-move algorithm, which eliminates the need for a possible 32-move algorithm later. The principle behind this is that in layer-by-layer you must constantly break and fix the first layer; the 2×2×2 and 2×2×3 sections allow three or two layers to be turned without ruining progress. One of the advantages of this method is that it tends to give solutions in fewer moves. The Roux Method, developed by Gilles Roux, is similar to the Petrus method in that it relies on block building rather than layers, but derives from corners-first methods. In Roux, a 3×2×1 block is solved, followed by another 3×2×1 on the opposite side. Next the corners of the top layer are solved. The cube can then be solved using only moves of the U layer and M slice. In 1997, Denny Dedmore published a solution described using diagrammatic icons representing the moves to be made, instead of the usual notation. Most beginner solution methods involve solving the cube one layer at a time, using algorithms that preserve what has already been solved. The easiest layer by layer methods require only 3-8 algorithms. The most move optimal online Rubik's Cube solver programs use Herbert Kociemba's Two-Phase Algorithm which can typically determine a solution of 20 moves or less. The user has to set the color configuration of the scrambled cube and the program returns the steps required to solve it. Speedcubing (or speedsolving) is the practice of trying to solve a Rubik's Cube in the shortest time possible. There are a number of speedcubing competitions that take place around the world. The first world championship organised by the Guinness Book of World Records was held in Munich on March 13, 1981. All Cubes were moved 40 times and lubricated with petroleum jelly. The official winner, with a record of 38 seconds, was Jury Froeschl, born in Munich. The first international world championship was held in Budapest on June 5, 1982, and was won by Minh Thai, a Vietnamese student from Los Angeles, with a time of 22.95 seconds. Since 2003, the winner of a competition is determined by taking the average time of the middle three of five attempts. However, the single best time of all tries is also recorded. The World Cube Association maintains a history of world records. In 2004, the WCA made it mandatory to use a special timing device called a Stackmat timer. In blindfolded solving, the contestant first studies the scrambled cube (i.e., looking at it normally with no blindfold), and is then blindfolded before beginning to turn the cube's faces. Their recorded time for this event includes both the time spent examining the cube and the time spent manipulating it. In multiple blindfolded, all of the cubes are memorised, and then all of the cubes are solved once blindfolded; thus, the main challenge is memorising many - often ten or more - separate cubes. The event is scored not by time but by the number of solved cubes minus the number of unsolved cubes after one hour has elapsed. In fewest moves solving, the contestant is given one hour to find his or her solution, and must write it down. Single time: The world record time for solving a 3×3×3 Rubik's Cube is 4.73 seconds, set by Feliks Zemdegs of Australia on 11 December 2016 at the POPS Open 2016 competition in Melbourne, Australia. Average time: The world record for average of five solves (excluding best and worst) is 5.97 seconds, set by Feliks Zemdegs of Australia on 28 June 2017 at LatAm Tour - Chía 2017. Prior to this, Zemdegs had set 9 of the last 10 average world records over the course of more than 7 years, beginning with his first world record average of 9.21 seconds on 20 January 2010. One-handed solving: The world record fastest one-handed solve is 6.88 seconds, set by Feliks Zemdegs of Australia on 10 May 2015 at Canberra Autumn 2015. The world record fastest average of five one-handed solves is 10.31 seconds, set by Max Park of the United States on 16 July 2017 at the World Championship 2017 in Paris. Feet solving: Jakub Kipa of Poland solved the Rubik's Cube with his feet in a world record time of 20.57 seconds on 27 June 2015 at Radomsko Cube Theory 2015. He also holds the world record mean of 3 solves of 28.16 seconds, set on 11 June 2016 at Mielec Cube Day 2016. Blindfold solving: The record for blind solving is held by Gianfranco Huanqui of Peru, who solved a cube blindfolded in 18.31 seconds (including memorization) on 24 June 2017 at LatAm Tour - Lima 2017. The world record mean of three blindfold solves is 22.67 seconds, set by Ishaan Agrawal of the United States on 24 June 2017 at 6.25 Bay Area 2017. Multiple blindfold solving: The record is held by Marcin Kowalczyk of Poland, who successfully inspected 41 cubes, donned a blindfold, and solved them, all under the time limit of one hour, on 16 November 2013 at SLS Swierklany 2013. Fewest moves solving: The world record fewest moves to solve a cube, given one hour to determine your solution, is 19. This has been achieved by Tim Wong of the United States on 11 October 2015 at Irvine Fall 2015, by Marcel Peters of Germany on 9 January 2016 at Cubelonia 2016, and by Vladislav Ushakov of Belarus on 27 August 2016 at PSU Open 2016. The world record mean of three fewest moves challenges (with different scrambles) is 24.33, set by Marcel Peters of Germany on 28 May 2016 at Schwandorf Open 2016. Non-human solving: The current non-human time record is for Sub1, a robot made by Adam Beer, an economist and industrial engineer. A YouTube video shows a 0.887 second solving time using an Arduino with the Kociemba algorithm. Next record is 3.25 seconds, set by CubeStormer III, a robot built using Lego Mindstorms and a Samsung Galaxy S4. This beats the prior 5.27 seconds, set by CubeStormer II, a robot built using Lego Mindstorms and a Samsung Galaxy S2. This had in turn broken the previous record of 10.69 seconds, achieved by final year computing students at Swinburne University of Technology in Melbourne, Australia in 2011. Highest order physical n×n×n cube solving: Kenneth Brandon solved a 17×17×17 cube in a total of 7.5 hours. Group solving (12 minutes): The record for most people solving a Rubik's Cube at once in twelve minutes is 134, set on 17 March 2010 by school boys from Dr Challoner's Grammar School, Amersham, England, breaking the previous Guinness World Record of 96 people at once. Group solving (30 minutes): On November 21, 2012, at the O2 Arena in London, 1414 people, mainly students from schools across London, solved the Rubik's Cube in under 30 minutes, breaking the previous Guinness World Record of 937. The event was hosted by Depaul UK. On November 4, 2012, 3248 people, mainly students of College of Engineering Pune, successfully solved the Rubik's cube in 30 minutes on college ground. The successful attempt is recorded in the Limca Book of Records. The college will submit the relevant data, witness statements and video of the event to Guinness authorities. There are different variations of Rubik's Cubes with up to seventeen layers: the 2×2×2 (Pocket/Mini Cube), the standard 3×3×3 cube, the 4×4×4 (Rubik's Revenge/Master Cube), and the 5×5×5 (Professor's Cube) being the most well known. The 17×17×17 "Over The Top" cube (available late 2011) is currently the largest (and most expensive, costing more than a thousand dollars) commercially sold cube. A working design for a 22×22×22 cube exists and was demonstrated in January, 2016 Chinese manufacturer ShengShou has been producing cubes in all sizes from 2×2×2 to 10×10×10 (as of late 2013). Non-licensed physical cubes as large as 13×13×13 based on the V-Cube patents are commercially available to the mass-market circa 2015 in China; these represent about the limit of practicality for the purpose of "speed-solving" competitively (as the cubes become increasingly ungainly and solve-times increase quadratically). These cubes are illegal (even in China) due to the fact that they violate Panagiotis Verdes' patents; however some countries do not enforce patent law strictly, leading to their general availability. In addition, some Chinese companies have produced 3×3×3 cubes with variations on the original mechanism that, while legally controversial, are generally considered to be far superior for competitive speedcubing. There are many variations of the original cube, some of which are made by Rubik. The mechanical products include the Rubik's Magic, 360, and Twist. Also, electronics like the Rubik's Revolution and Slide were also inspired by the original. One of the newest 3×3×3 Cube variants is the Rubik's TouchCube. Sliding a finger across its faces causes its patterns of coloured lights to rotate the same way they would on a mechanical cube. The TouchCube also has buttons for hints and self-solving, and it includes a charging stand. The TouchCube was introduced at the American International Toy Fair in New York on February 15, 2009. The Cube has inspired an entire category of similar puzzles, commonly referred to as twisty puzzles, which includes the cubes of different sizes mentioned above as well as various other geometric shapes. Some such shapes include the tetrahedron (Pyraminx), the octahedron (Skewb Diamond), the dodecahedron (Megaminx), the icosahedron (Dogic). There are also puzzles that change shape such as Rubik's Snake and the Square One. In 2011, Guinness World Records awarded the "largest order Rubiks magic cube" to a 17×17×17 cube, made by Oskar van Deventer. Since 2015, with the mass production of the Icosaix, all five platonic solids analogous to Rubik's cube (face-turning with cuts one-third from each face, except the Pyraminx, which also has turnable tips) became available. Besides Rubik's cube, the tetrahedron is available as the Pyraminx, the octahedron as the Face Turning Octahedron, the dodecahedron as the Megaminx, and the icosahedron as the Icosaix. Some puzzles have also been created in the shape of the Kepler-Poinsot polyhedra, such as Alexander's Star (a great dodecahedron). Puzzles have been built resembling the Rubik's Cube or based on its inner workings. For example, a cuboid is a puzzle based on the Rubik's Cube, but with different functional dimensions, such as 2×2×4, 2×3×4, and 3×3×5. Many cuboids are based on 4×4×4 or 5×5×5 mechanisms, via building plastic extensions or by directly modifying the mechanism itself. Some custom puzzles are not derived from any existing mechanism, such as the Gigaminx v1.5-v2, Bevel Cube, SuperX, Toru, Rua, and 1×2×3. These puzzles usually have a set of masters 3D printed, which then are copied using moulding and casting techniques to create the final puzzle. Other Rubik's Cube modifications include cubes that have been extended or truncated to form a new shape. An example of this is the Trabjer's Octahedron, which can be built by truncating and extending portions of a regular 3×3. Most shape mods can be adapted to higher-order cubes. In the case of Tony Fisher's Rhombic Dodecahedron, there are 3×3, 4×4, 5×5, and 6×6 versions of the puzzle. Puzzles like the Rubik's Cube can be simulated by computer software, which provide functions such as recording of player metrics, storing scrambled Cube positions, conducting online competitions, analysing of move sequences, and converting between different move notations. Software can also simulate very large puzzles that are impractical to build, such as 100×100×100 and 1,000×1,000×1,000 cubes, as well as virtual puzzles that cannot be physically built, such as 4- and 5-dimensional analogues of the cube. Google has released the Chrome Cube Lab in association with Ernő Rubik. The site has various interactive objects based on Rubik's Cube. Customised versions of Rubik's Cube can be created and uploaded.